Harris Corporation (NYSE:HRS) has received a $260 million order to develop an integrated tactical communications network as part of an Asia-Pacific country’s modernization program — the order was received in the first quarter of fiscal 2018. 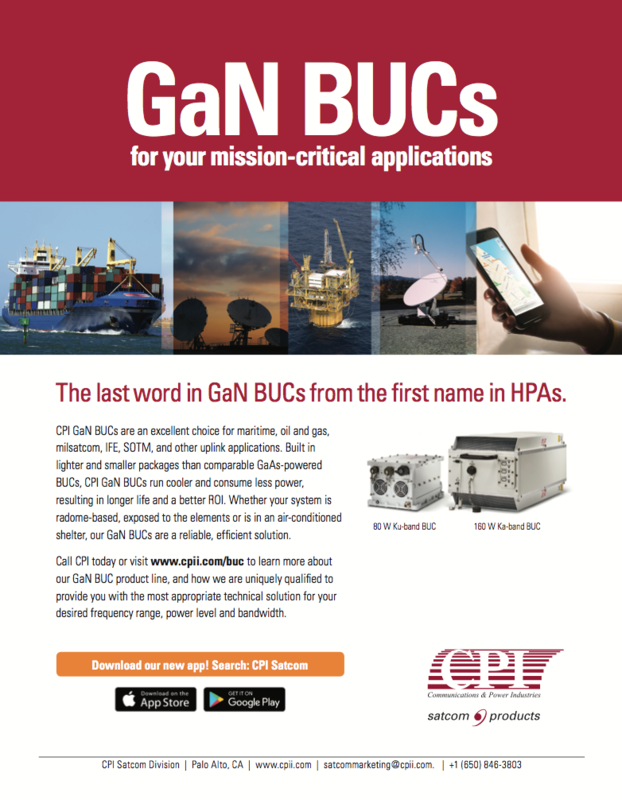 The integrated network solution will include tactical radios, network planning, monitoring and routing software, and other systems and technology from Harris and partnering companies. 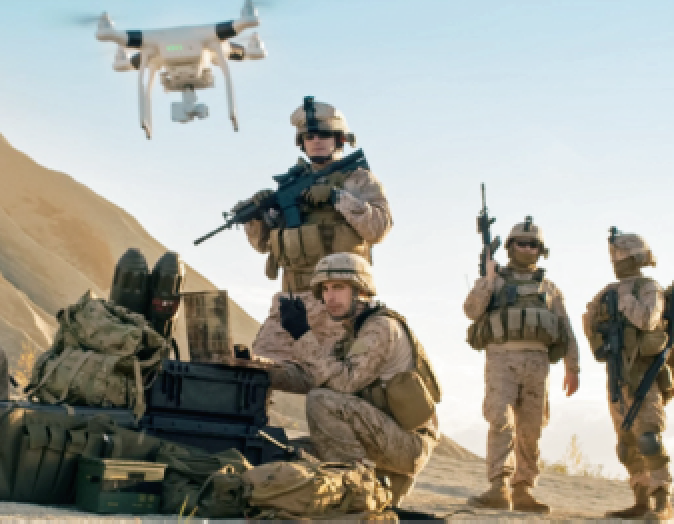 The solution will feature Harris’ Falcon III® AN/PRC-158 multi-channel manpack radios and vehicular amplifiers and provide voice and data services to tactical forces for line-of-sight and beyond-line-of-sight applications. 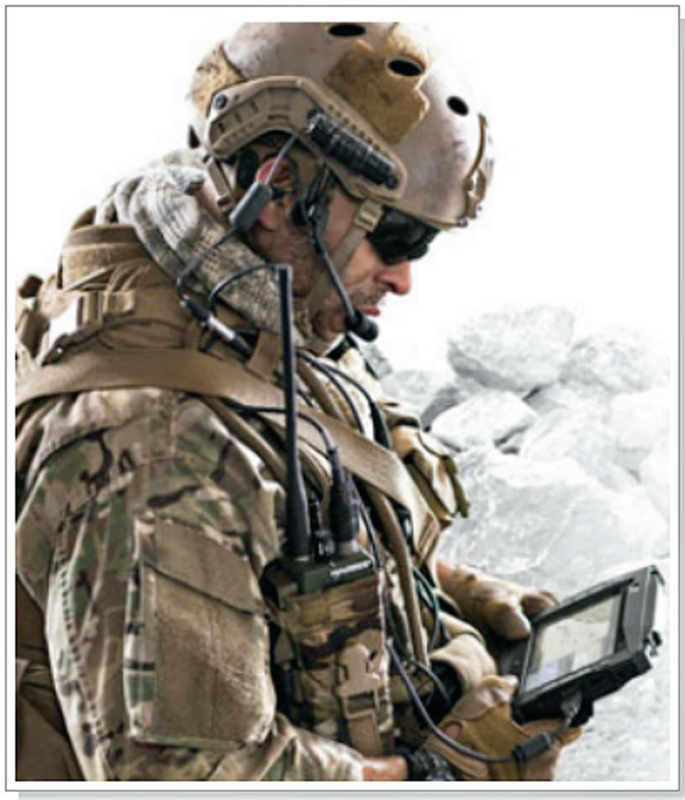 “Harris is the incumbent tactical radio provider to the country, and this order is an important step in integrating Harris’ advanced products into their tactical communications network," said Brendan O'Connell, president, Tactical Communications, Harris Communication Systems. "Our integrated solution will play a pivotal role in the customer’s continued modernization efforts." 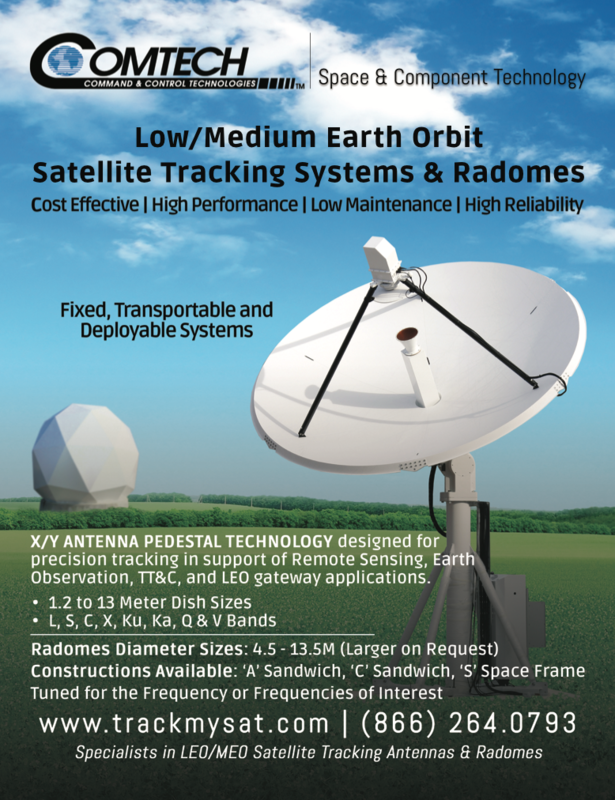 AMSAT has reported that the U.S. Air Force Academy satellite FalconSAT-3 is now open for amateur radio use as a digital store-and-forward system. Photo of the U.S. Air Force FalconSAT-3 satellite. FalconSAT-3 was built in 2005 and 2006 by cadets and faculty in the Space Systems Research Center at the U.S. Air Force Academy in Colorado Springs, Colorado, and launched in 2007 on an Atlas V. After serving in scientific and training roles, the Academy has now made the satellite available for amateur radio use. The satellite is in a 35.4 degree inclination orbit, with an approximate altitude of 465 to 476 km. The Packet Bulletin Board System is operating at 9600 baud with a 145.840 uplink and 435.103 downlink. Output power is 1 watt and the downlink is continuously on. Digipeating is enabled for live QSOs, but unattended digipeating operations are not authorized at this time. Current Keplerian elements can be found in the AMSAT distributed Keplerian elements. 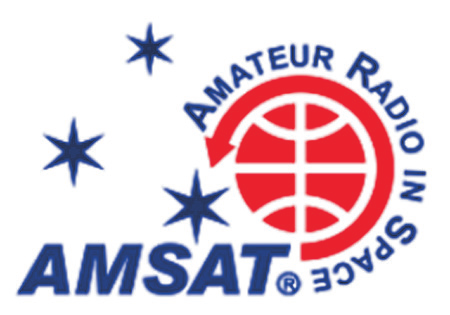 The Radio Amateur Satellite Corporation (as AMSAT is officially known) was first formed in the District of Columbia in 1969 as an educational organization with the goal to foster Amateur Radio’s participation in space research and communication. 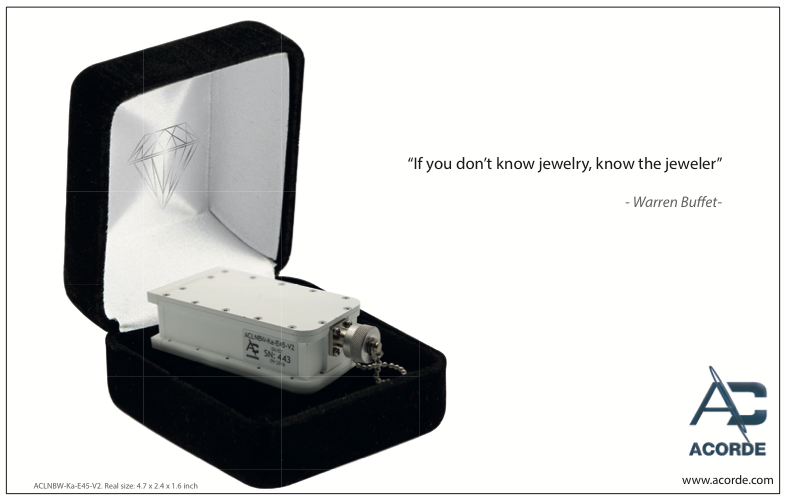 Today, the “home-brew” flavor of these early Amateur Radio satellites lives on, as most of the hardware and software now flying on even the most advanced AMSAT satellites is still largely the product of volunteer effort and donated resources. 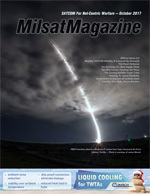 For more than 48 years, AMSAT groups in North America and elsewhere have played a key role in significantly advancing the state of the art in space science, space education, and space technology. Undoubtedly, the work now being done by AMSAT volunteers throughout the world will continue to have far-reaching, positive effects on the very future of both Amateur Radio, as well as other governmental, scientific and commercial activities in the final frontier. Rarely have a group of “amateur” volunteers managed to do so much… for so many… with so little. At this year's 11th Mobile Deployable Communications Conference, qualified specialists will be providing their knowledge of how to avert cyber warfare with the goal of ensuring flexible and continuous connectivity. Flexible and continuous connectivity, anywhere, at any time remains a key priority for major defense forces around the world. With the critical threat of cyber warfare intensifying, there is now a pressing need to ensure secure communications can be effectively operated in contested environments. Taking place in Warsaw, Poland on February 1-2, 2018, SMi’s 11th Annual Mobile Deployable Communications Conference returns to look at the key drivers causing the growing demand for flexible, protected, and interoperable CIS capabilities. Through expert led presentations, from some of the world's leading authorities, will discuss the challenges for both solution providers and end-users of deployable communications. Joining the host nation will be neighboring and international speakers who will provide a diverse but focused two-day agenda. This conference is sponsored by: General Dynamics Mission Systems, GMRE Inc, NSSLGlobal and Tampa Microwave. There is a £400 early bird booking discount available until October 31st. The Hindu publication has reported that work has started in Bengaluru, India, to assemble a substitute navigation spacecraft, which became essential after the main backup was lost in a failed launch on August 31, 2017. IRNSS-1I was earlier approved as a ground spare, to be sent to space in an emergency. The Indian Space Research Organisation has been training a team from an industry consortium to assemble this spacecraft and its lost fellow satellite, IRNSS-1H. M. Annadurai, director of ISRO Satellite Center (ISAC), Bengaluru, said the current approval is for seven navigation spacecraft (all of which are in orbit) and two spares — IRNSS-1H and IRNSS-1I. Should a new backup be sought and approved, it may be part of another model of outsourcing of its satellites to the Indian industry. ISRO has just begun the process of identifying a set of external partners who would assemble its future satellites, he noted. Until now all Indian spacecraft have been assembled at ISAC by its engineers. 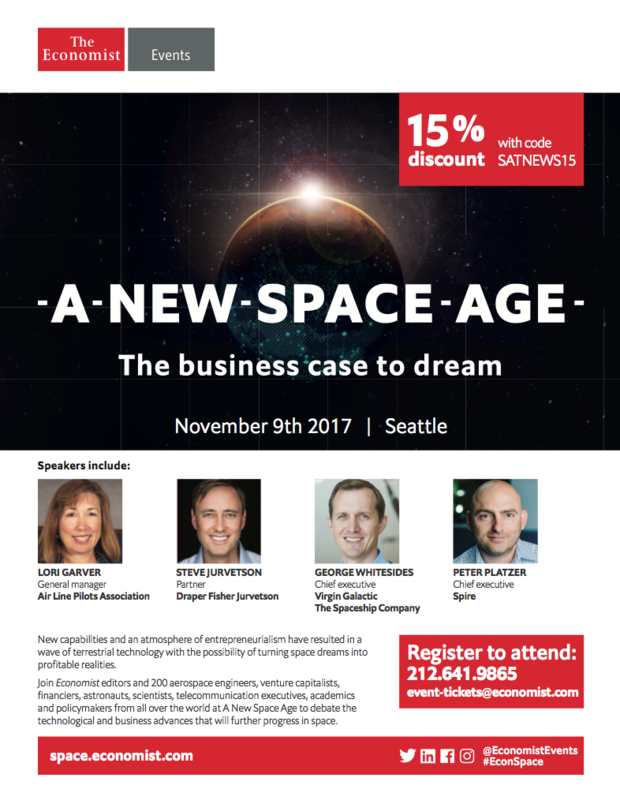 Back in December, the consortium of six industries was given six months to work on each spacecraft. The deadline for IRNSS-1I was around May of 2018. Dr. Annadurai said that as of now, the timeline remained the same. The launch of 1I, when it was ready, would also have to align with ISRO’s other missions, he said. ISRO awaits the report of the failure analysis committee, which is looking into reasons why the launch failed, before it returns to launch its next missions. 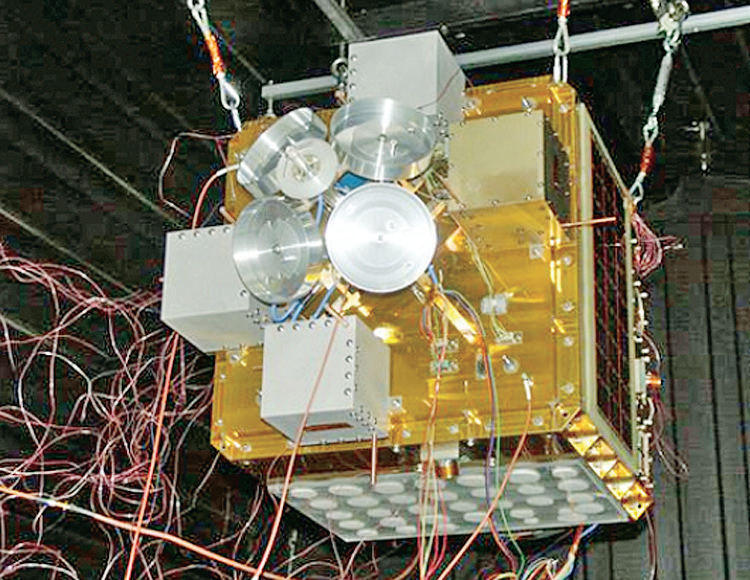 The seven IRNSS spacecraft, from 1A to 1G, are part of the 1,400-crore GPS-like fleet for India, called NavIC (Navigation in Indian Constellation). They were put in orbit between July 2013 and April 2016 and have a life of 10 years each. Soon after all of these satellites were in place, all three atomic clocks in IRNSS-1A failed, warranting that spacecraft's replacement. IRNSS-1H was sent up on a PSLV rocket but was not released from the upper heat shield of the rocket and has been falling slowly to Earth in the same state, embedded in the heat shield — this is where 1I enters — as a backup to both IRNSS-1A and IRNSS-1H. The atomic clocks on the other satellites are being used sparingly to extend the clocks’ life in space. ISRO chairman A.S. Kiran Kumar recently said there was no urgency as the remaining six are working as planned. Communications in the Virgin Islands Restored by U.S.A.F. Six Airmen assigned to the Joint Incident Site Communications Capability team of the 151st Air Refueling Wing in Salt Lake City, Utah, deployed to the U.S. Virgin Islands September 7, to provide critical communications in the wake of Hurricane Irma. Chief Master Sgt. Don Johnnson and Staff Sgt. 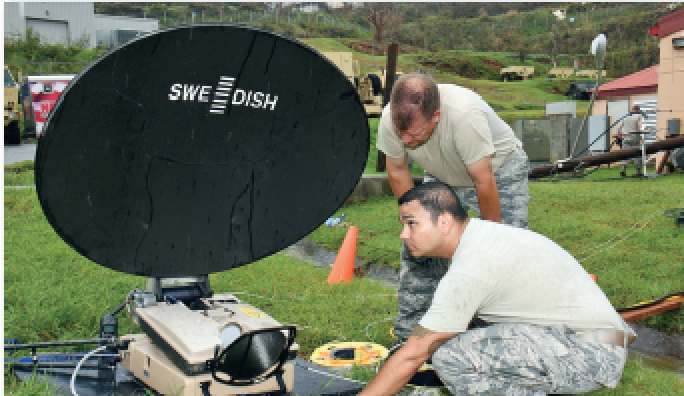 Tony Baca, Joint Incident Site Communication Capability team members with the 151st Air Refueling Wing Communications Flight in Salt Lake City, Utah, set up a SWE-DISH CCT120 satellite dish outside the Leonard B. Francis Armory in St. Thomas, U.S. Virgin Islands, September 20, 2017. The September 7 deployment of the Utah JISCC helped re-establish critical military and emergency civil service communications within areas of the U.S. Virgin Islands severely impacted by Hurricanes Irma and Maria. U.S. Air National Guard photo by Master Sgt. Paul Gorman. The Utah Airmen established a base of operations at the Leonard B. Francis Armory in St. Thomas, rapidly setting up the antenna systems required to provide the islands Tactical Operations Center with a wide array of communications capabilities. JISCC capabilities are designed to augment civilian first responders, and bridge the communications gap between military and civilian agencies. Each team is equipped to establish remote internet, telephone and radio capabilities at locations with a damaged or nonexistent communications infrastructure. The 151st ARW JISCC is one of 42 block three teams distributed throughout the Air National Guard, 15 of which are currently mobilized to support hurricane damaged regions of Texas, Florida, and the U.S. Virgin Islands. According to Chief Master Sgt. Don Johnson, vice chairman of the ANG JISCC working group, recent events represent a historic activation of the domestic operations asset. “While JISCC teams are routinely called upon to support regional incidents and events benefiting from their unique capabilities, the recent chain of hurricanes impacting the southeastern U.S. has resulted in the largest mobilization of JISCC assets since first fielded to the ANG,” Johnson said. A C-17 Globemaster from the 164th Airlift Wing sits on the flight line at Roland R. Wright Air National Guard Base in Salt Lake City on Sept. 7, 2017. The aircraft will take Airmen from the151st Communications Flight to the U.S. Virgin Islands in support of Hurricane Irma relief efforts. U.S. Air National Guard photo by Tech. Sgt. Chris Cook. On September 19th, the Virgin Islands were further impacted by the passing of Hurricane Maria. The Utah JISCC members were forced to disassemble their equipment in advance of the storm, and re-establish communications in its wake. Airman 1st Class David Zham, newest member of the Utah JISCC team considered the event little more than an interruption. With the extensive damage further levied by the passing of Hurricane Maria, additional ANG JISCC teams are being mobilized to meet the continued requirements for emergency communications support to the region. High school students visited Camp Dodge, in Johnston, Iowa for the Iowa National Guard’s inaugural STEM (Science, Technology, Engineering and Math) Day. 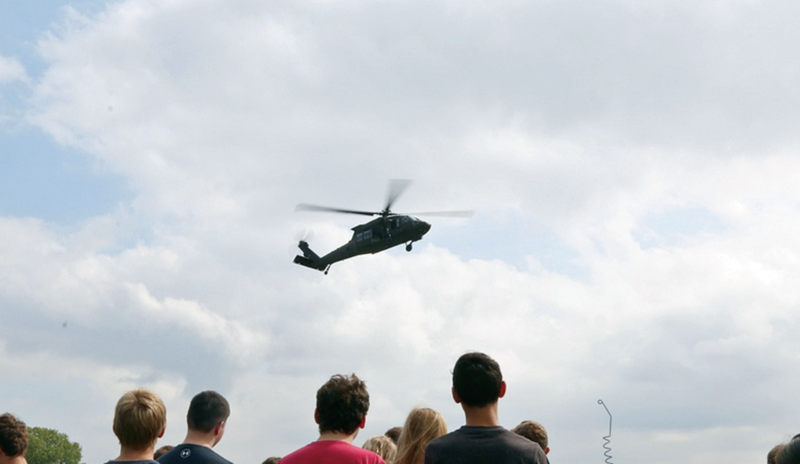 High School Students from Harlan Community High School, in Harlan, Iowa, and Davis County Community High School, in Bloomfield, Iowa, watch UH-60 “Black Hawk” helicopters practice sling load maneuvers during the Iowa National Guard’s inaugural STEM (Science, Technology, Engineering and Math) Day event at Camp Dodge, in Johnston, Iowa. The Guard hosted its first STEM Day in an effort to showcase the applications of science, technology, engineering and mathematics in day-to-day military operations. U.S. Army National Guard photo by Cpl. Tawny Schmit. Approximately 40 students spent Wednesday with Soldiers and Airmen, learning about science, technology, engineering and mathematics applications in the military. Harlan Community High School and Davis County Community High School — the first two schools to participate in what the Guard hopes to be a quarterly program — each invited high school students in their STEM or career technical programs to attend the field trip. Dan Maeder, superintendent of Davis County Community School District in Bloomfield, and the battalion commander of the Iowa Army National Guard’s 224th Brigade Engineer Battalion in Cedar Rapids, said STEM Day was a chance for him to make a connection between his civilian life and his military service. “I’d be happy to bring my perspective as a school superintendent and a Guard soldier to help make this a successful program for the Guard and our schools as well,” Maeder said. Justin Wagner, superintendent of Harlan Community Schools and the Iowa National Guard’s Vice Chief of the Joint Staff, was similarly positioned to help get the first event off the ground. While at STEM Day, students toured the Iowa National Guard’s Sustainment Training Center, a state-of-the-art facility where they learned about plasma cutting, metallurgy and calculating amperage. Staff Sgt. Beth Rodas, a geospatial intelligence analyst with the Intelligence, Surveillance and Reconnaissance Group (ISRG) at the 132nd Wing, Iowa Air National Guard in Des Moines, Iowa, gives a presentation to high school students about identifying aircraft, submarines and other military vehicles in satellite imagery during the Iowa National Guard’s inaugural STEM Day event at Camp Dodge, in Johnston, Iowa. Rodas is a member of the ISRG’s STEM Outreach Program and works regularly with the Governor’s STEM council to spread the word about science, technology, engineering and mathematics in the Iowa National Guard. U.S. Army National Guard photo by Staff Sgt. Christie Smith. They also visited the Black Hawk Aircrew Trainer, a flight simulator using real UH-60M “Black Hawk” controls and technology to recreate challenges faced by helicopter pilots, and the Medical Simulation Training Center, where combat medics are assessed on their ability to treat casualties by treating technologically-sophisticated mannequins that breathe, bleed and react to touch. Students were also able to watch actual Black Hawk helicopters practice sling load maneuvers, see an Unmanned Aerial Vehicle (UAV) demonstration, and test their skills with one of the Iowa Air National Guard’s intelligence analysts. Staff Sgt. 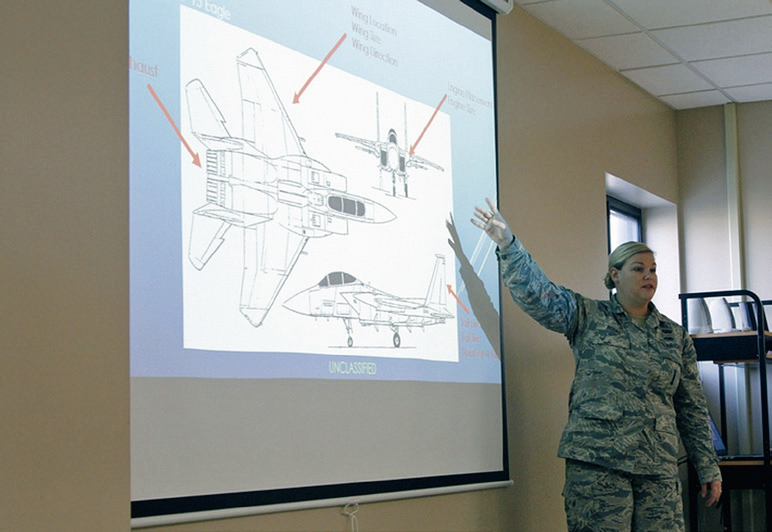 Beth Rodas, a geospatial intelligence analyst with the Intelligence, Surveillance and Reconnaissance Group (ISRG) at the 132nd Wing, Iowa Air National Guard in Des Moines, gave students a presentation on how to identify aircraft, submarines and tanks in satellite imagery. After her class, she tested students’ ability to decipher actual photographs in a timed game that resulted in prizes for the high schoolers. As a member of the STEM Outreach Program at the ISRG, Rodas spends a lot of time visiting high schools and colleges to talk about how she utilizes STEM for the military. Rodas partnered with several other Soldiers and Airmen to help plan Camp Dodge’s STEM Day. In the past year, the Iowa National Guard has put an emphasis on STEM outreach as Maj. Gen. Timothy Orr, the Adjutant General, has joined the governor’s STEM council. “From the Guard’s perspective, I’m excited about it because there’s a misconception out there in many communities that the National Guard is full of door-kickers and infantry shooters and killers,” Maeder said. As for the students, STEM Day was a hit. Maggie Koke, a senior at Harlan Community High School, said she was surprised to learn how much STEM plays a role in the military’s day-to-day operations. Although seeing the helicopters was cool, Koke said her favorite parts were experiencing the Humvee Egress Assistance Trainer — a simulator used to recreate the experience of a vehicle rollover — and the Engagement Skills Trainer — a simulator, similar to a video game, used for weapons training. With the first STEM Day in the books, the Iowa National Guard hopes to continue the program several times throughout the school year to host schools and students from around the state. “This is just the beginning,” Rodas said. Spectra Group (UK) Ltd. has announced an extension of the SlingShot® sales partnership with Airbus — SlingShot is a cost-effective solution that enables secure BLOS COTM (Beyond Line Of Sight Communications On The Move) using in-service tactical radios connected to a global commercial satellite network provider. Using SlingShot, existing tactical radios can be connected to commercial L-band SATCOM in order to extend secure Command and Control COTM for UHF and VHF radios BLOS. Small, lightweight and flexible, SlingShot can be used dismounted or on any transport platform, including fixed wing aircraft and helicopters, extending tactical communications to where it is needed. With reduced cost compared to other SATCOM BLOS options, increased channel availability and minimal training burden, SlingShot is redefining tactical communications. 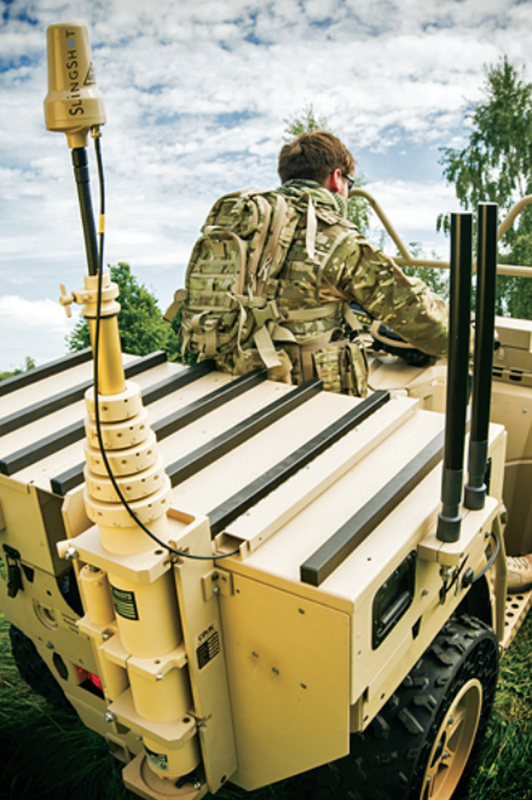 Daz Ware, the Head of Sales for UK Land at Airbus, explained that the ability to communicate from anywhere to anywhere is especially critical in the military environment. Daz explained that as a leading military communications service provider, it is important for Airbus to have a wide range of solutions in the company's portfolio to meet all their customers’ needs and requirements and this partnership with Spectra offers this unique radio extension capability to complement an already strong company portfolio. Steff Taylor, the Head of Business Development at Spectra noted that before the development of SlingShot, military forces and government agencies were limited to line of sight tactical communications on the move. 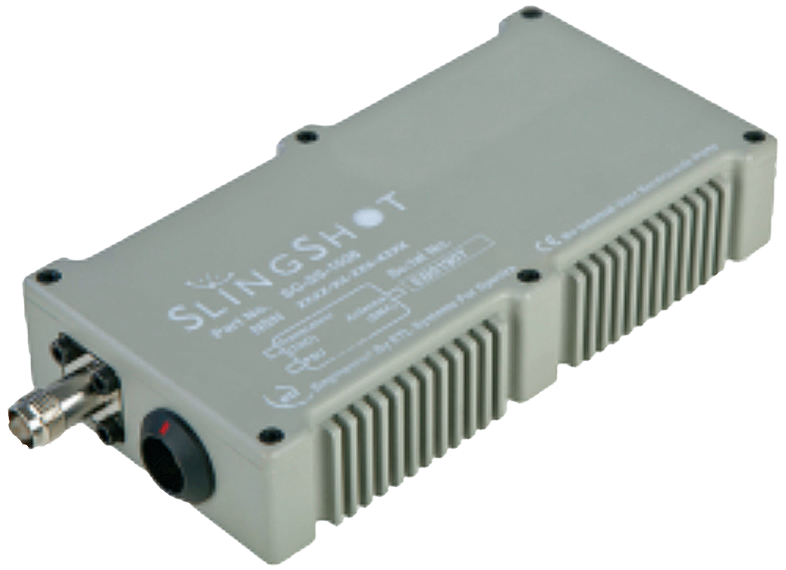 Slingshot offers dedicated bandwidth for secure communications while creating a BLOS communications network that can extend over thousands of kilometers. Taylor also commented that this is a capability that Airbus will be able to offer their customers on a wider basis. Working with its worldwide sales team to supply SlingShot, this partnership builds on two years of successful delivery to the UK. This relationship shows the strength and importance of SlingShot in defence and national security market places.